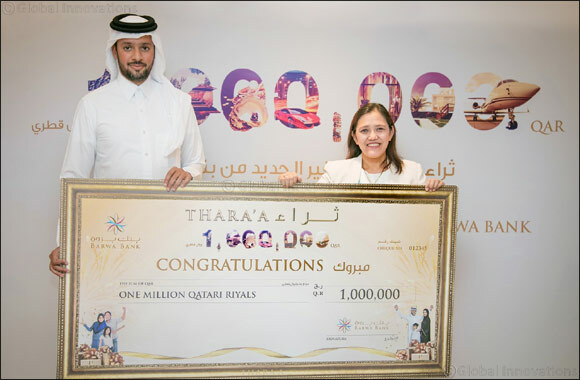 January 23, 2019 Dubai, United Arab Emirates: Barwa Bank has announced Mercy Pabilona as the winner of its QAR 1 million Thara’a grand prize. The draw was conducted under the supervision of a representative of the qualitative license and market control department at the Ministry of Commerce & Industry. Thara’a, Qatar's Shari’ah compliant and the first in Islamic bank’s sector, offers account holders the chance to benefit from cash rewards up to 1,000,000 Qatari Riyals. Based on several criteria, Thara’a account holders are eligible for a number of periodic draws for cash prizes. Totalling 3,300,000 Qatari Riyals, Thara’a cash rewards are distributed on both a monthly and biannual basis to customers holding a minimum balance of 10,000 Qatari Riyals. On a monthly basis, there are 21 winners per draw for the cash prize of 5,000 Qatari Riyals, as well as 2 winners per draw for the cash prize of 10,000 Qatari Riyals. Additionally, twice-a-year there are 2 winners per draw for the cash prize of 25,000 Qatari Riyals prize, 2 winners per draw for the cash prize of 50,000 Qatari Riyals and 1 winner per draw for the grand prize of 1,000,000 Qatari Riyals. Rewarding 194 winners in total with cash prizes up to 3,300,000 Qatari Riyals. “We would like to extend our congratulations to our One Million Qatari Riyals grand prize winner. Coupled with cash prizes and a reward scheme, Thara’a is a product full of value-added benefits and services. Thara’a offers account holders access to Barwa Bank’s innovative banking channels, with benefits including unlimited withdrawals and deposits, as well as free fund transfers across their accounts and through all Barwa Bank channels. Barwa Bank offers an extensive variety of personal banking products and investments, as well as seven strategically located branches and a broad network of ATMs located across Qatar. Customers can access their accounts at any time through the state-of–the-art online banking, or via the 24/7 Contact Centre.